Featured celebrity guests at this year's event included Bryan Caswell of The Next Iron Chef and Best In Smoke, White House chef and senior policy advisor Sam Kass, and Good Eats host Alton Brown -- who also made some astonishing remarks concerning molecular gastronomy during the convention. USA's Chef of the Year: Todd Kelly of the Hilton Cincinnati Netherland Plaza. Pastry Chef of the Year: Kyongran "Alex" Hwang of Atlanta's Cherokee Town and Country Club. Chef Professionalism Award: Russell Scott of Windermere's Isleworth Golf and Country Club in Florida. Chef Educator of the Year: Dina Altieri, chef and instructor at Chicago's Kendall College. Student Chef of the Year: Aaron Guajardo III, graduate of Joliet Junior College. 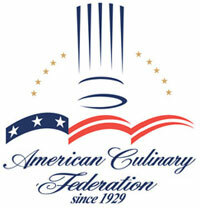 2011 American Academy of Chefs Culinary Hall of Fame Inductees: Anthony Graffeo, John Kaufmann, William Lyman, Bruce Riddell, and Jim Doherty (honorary).